San Antonio company Texas All Pro Plumbing & Air Conditioning is holding a contest to giveaway a free water softener to one lucky winner. Are you suffering from hard water in between San Antonio and Austin TX areas? San Antonio, TX, September 20, 2013 --(PR.com)-- Texas All Pro Plumbing & Air Conditioning has been serving San Antonio and surrounding areas, both residentially and commercially, since 1972. All Pro provides a wide range of plumbing and air conditioning services for homeowners and businesses. All Pro was founded on values of customer satisfaction and professional service. All Pro knows its customers are the company's business so when clients call All Pro the company always send a knowledgeable technician who will show up on time, treat clients with respect, and get the job done right. All Pro has over 50 years of combined industry experience and utilize the industry leading equipment and technology to perform the highest quality plumbing and air conditioning services available. San Antonio’s water is notoriously hard, so one of the company's areas of expertise is water softener installation, repair, and maintenance services. Hard water contains high levels of calcium and magnesium which can damage plumbing and appliances. These minerals deposit and will cause buildups in pipes, fittings, and fixtures. Hard water will also buildup in appliances, such as a water heater, which will decrease efficiency leading to higher electric and gas bills. Studies show that hard water can cause homeowners to use up to 8 times more soap and things still are not as clean. Additionally, hard water leaves white spots on dishes and shower doors. All of these problems can be solved by installing a water softener into the plumbing system. Water softeners reduce calcium and magnesium levels in water and can contribute to many enjoyable benefits in the kitchen and bathroom. Dishes and china will be sparkling clean using less soap. A coffee maker will be clean without scale or build up from mineral deposits. The conditioned water will also leave skin feeling softer and smoother after showering. These are just a few of the benefits homeowners will experience from having a water softener installed in their home. To help one lucky San Antonio resident battle the area’s hard water, Texas All Pro will be giving away a free 60,000 grain water softener after All Pro's Facebook page reaches 500 likes. The contest is simple; to enter client's must like the company's page on Facebook. Once All Pro reaches 500 likes the company will randomly select one contest entrant living between the extended San Antonio and Austin areas. Texas All Pro is committed to the company's customers and All Pro's team works tirelessly to get every job done right. So, if homeowners run into a plumbing or air conditioning problem, they don’t hesitate to call on All Pro. All Pro can handle any plumbing repair job from a running toilet to installing a new trenchless water line. The company also offer a wide range of commercial and residential air conditioning services. Whether clients are in need of plumbing or HVAC service, they can count on All Pro. 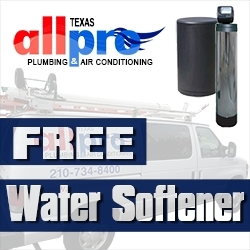 For more information on the services All Pro offers and the water softener contest, visit Texas All Pro’s website.